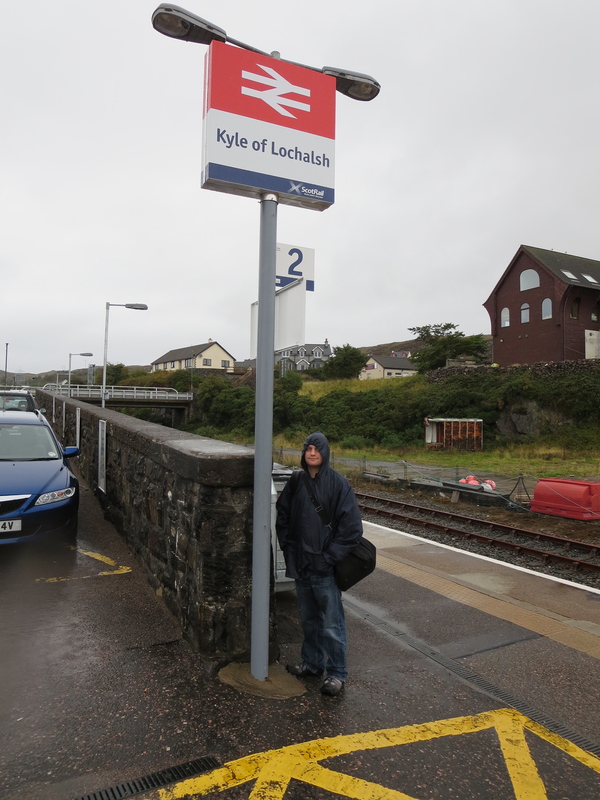 I’d got a sense of how enchantingly remote and enticingly melancholy this place might be from Michael Palin’s 1980 Great Railway Journey for BBC2, where he travelled all the way from Euston to Kyle in order to collect a frankly preposterous piece of signage. There was no such treat waiting for us: just a solitary train on a rain-soaked, deserted platform, that looked at any moment as if it could roll gently into the sea. But in its own way this view was intensely reassuring. 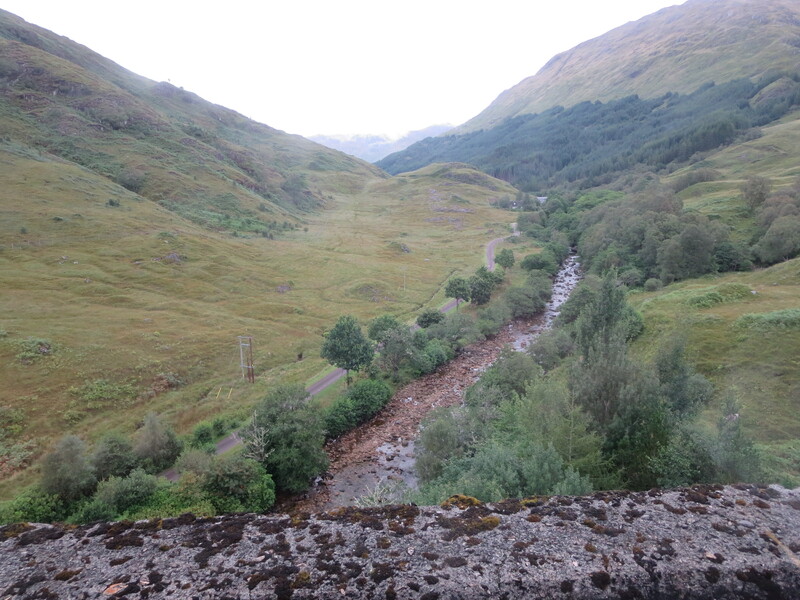 We’d just completed a tricky journey from Fort William by rail, sea and road via the Isle of Skye. I’d got very anxious about this, chiefly because it wasn’t by rail, rail and more rail. Ferries and coaches are not as reliable as trains. You can’t always book them in advance. Worse, they have a nasty habit of doing THEIR OWN THING. So it was a great relief to have manoeuvred ourselves successfully from one outpost of the network to another, and to see the welcoming, warm, cosy, purring cocoon of the Scotrail train to Inverness waiting for us. There was even time for a mooch about on the platform and indulge my inner Michael. Palin, that is, not Portillo. Never Portillo. Pretty much the only objectionable people we encountered during our travels were those who weren’t from Scotland. Or rather, those who didn’t have Scottish accents. Everyone else was selflessly, nonchalantly and overwhelmingly friendly. Now, I realise my generosity of attitude towards humankind has been gnarled away by living in London for the last seven years. My default reaction to being among strangers has become one of at best suspicion, at worst horror. So even the mildest of good manners is liable to strike me as the noblest of gestures. But I reckon even my emotions weren’t quite so jaundiced as to mistake simple courtesy for warm hospitality. The fact that the Scottish accent remains heart-janglingly gorgeous helped matters, naturally. I could, and did, merrily eavesdrop on many fellow passengers discussing the most mundane of topics. No, the problem came only when other dialects cut across this alluring patter. Like those posh students on the Caledonian sleeper heading up to Fort William. 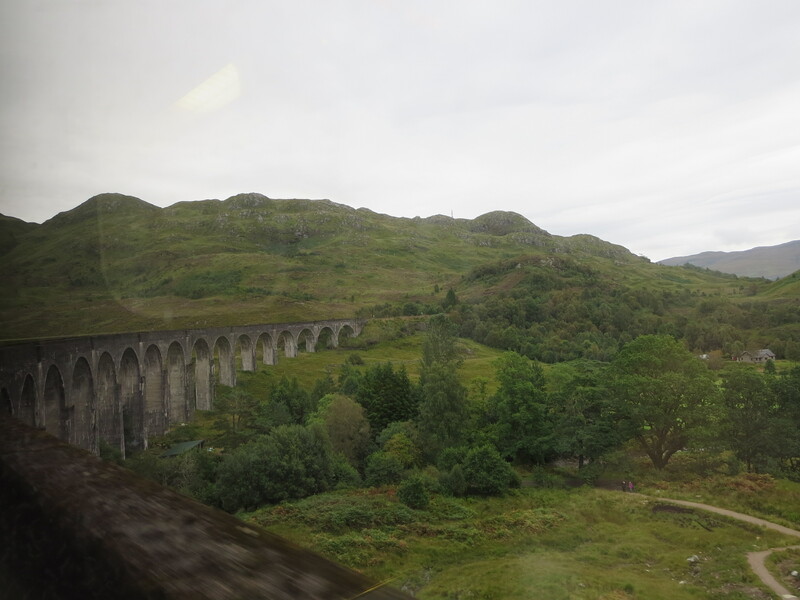 Or the English tourists (yes, I know, I am a hypocrite) on the train between Fort William and Mallaig who refused to call the Glenfinnan viaduct by any other name than “the Harry Potter bridge”. “Are you taking a picture of the Harry Potter bridge?” one said to me, as I moved along the carriage to get a better view. How I would’ve liked to have magicked him out of existence with some baroque-sounding spell. But of course that would’ve been impossible, because there are no such thing as spells, just like there’s no such thing as a Harry Potter bridge. Least agreeable of all, however, were the American couple we sat in front of on the train from Inverness to Edinburgh. Her husband responded to all of these ejaculations with a grunt, before burying himself in a book called Whiskeypedia. Why even go travelling, and in some of the most attractive areas of the UK, if all you’re planning on doing is reading bits out from a tabloid? You can stay at home and watch people do that on the Andrew Marr show every Sunday morning. 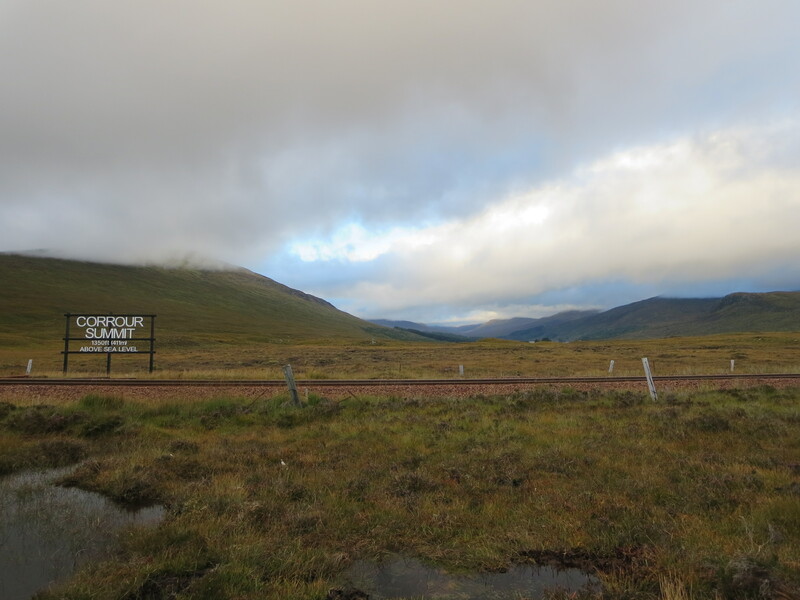 The highest station in mainland Britain is also one of the most remote. So remote, in fact, that it isn’t connected to the national grid. A wind turbine on the platform provides all of the power. Except when it’s broken, that is, and the place is plunged into blackness that is blacker than you’ll ever know. 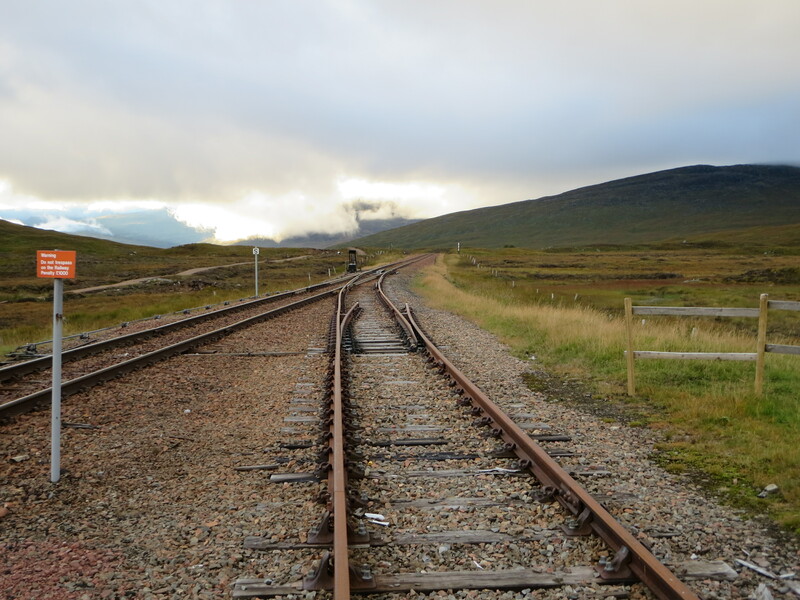 I got a touch of the dooms on Corrour station when, after a fantastic evening meal at the Station House restaurant, we trooped outside for a train back to Fort William to find the place in complete darkness. Only the light from my phone ensured we made it on to the platform and not into a peatbog. Then another light began to appear, somewhere in the distance, getting nearer, bigger, louder. I fretted and contemplated some kind of Railway Children-style intervention. Robert, however, stayed perfectly calm, convinced the train would stop regardless of the absence of any illumination whatsoever. 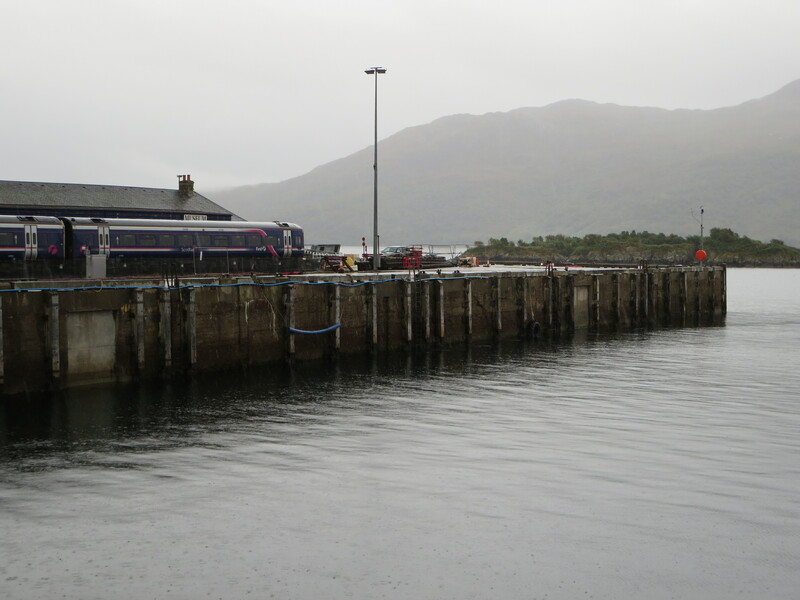 But it was the last service to Fort William, I jabbered. If it didn’t stop, we’d be stranded until morning. Naturally, the train stopped and all was well. The whole incident somewhat soured my opinion of the station – until an hour or so later, once we were safely back in our hotel, and I realised to what an utterly entrancing place we’d just been. 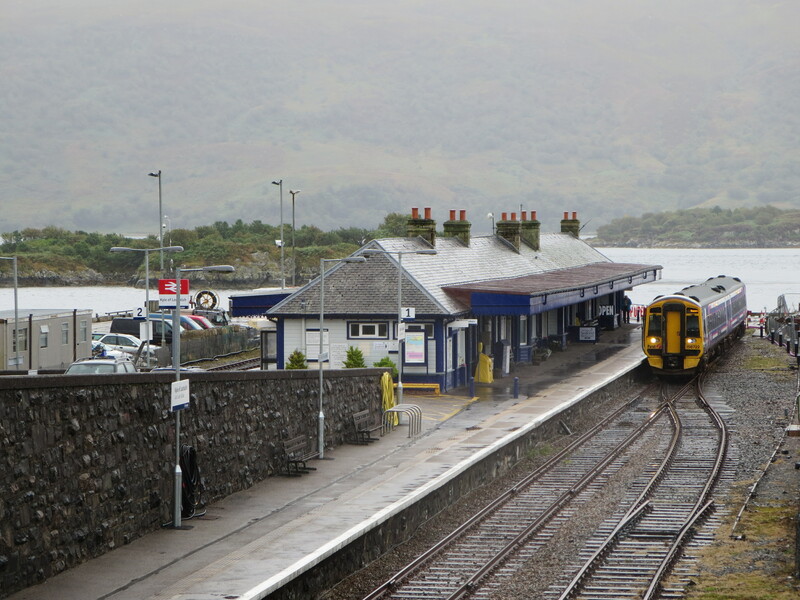 It’s a bargain: just over £80 for four days’ travel on the railways anywhere in the north of Scotland, plus free passage on the ferry to Skye. You can order it online (almost unheard of for a rover ticket) and it arrives in the post next day (almost unheard of for anything). Plus, and perhaps most impressive of all, not once did a ticket inspector look suspicious or even quizzical when we presented it for scrutiny. Usually a ranger or rover ticket gets a reaction ranging from the sniffy to the hostile. Not with Scotrail staff. They all seemed totally relaxed and familiar with the Highland Rover, and would often throw in a helpful reminder or non-patronising query for good measure. In the words of the sainted Bluetones, no challenge should be faced without a little charm and a lot of style – even pushing the refreshment trolley. Befitting a place that has the feel of a base camp forever waving goodbye to people striking out in the northern wilds, Inverness station has immense self-regard. I was quite taken by its obsession with itself and its shameless celebration of former glories. Most of the interior is so clinically rendered that it needs a few bulletins of nostalgia to provide a bit of colour. 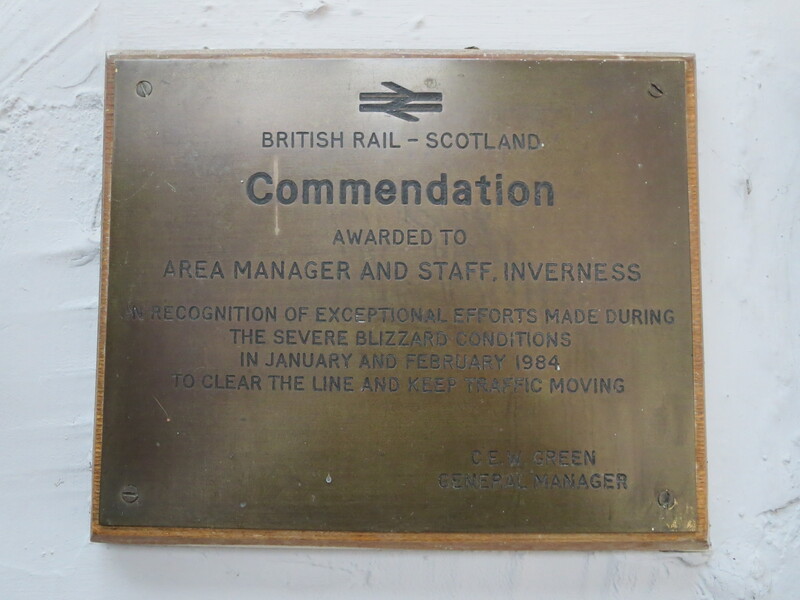 The bronze plaque from British Rail thanking the station staff for “exceptional efforts” during the winter of 1983/84 was probably my favourite. I like how the general manager made sure he got a namecheck, but everyone else was kept dutifully anonymous. Two near-naked men are also on permanent display for your perusal. 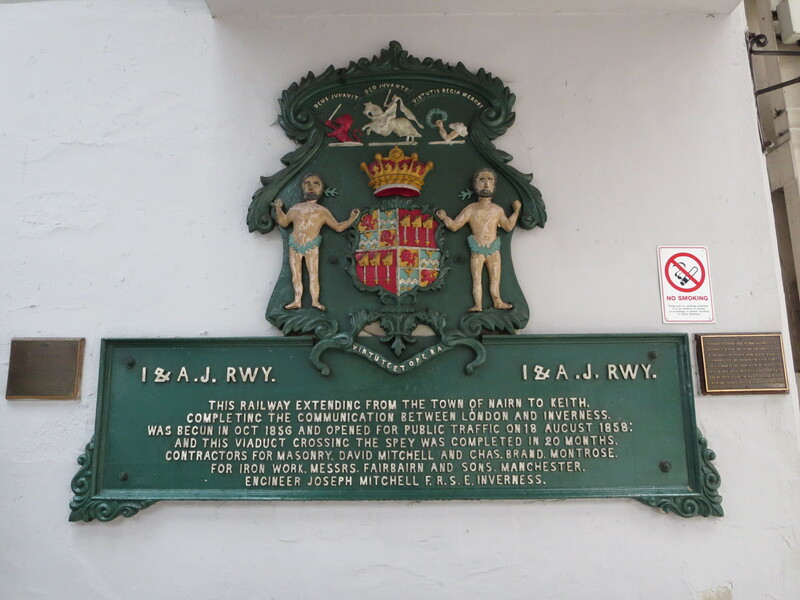 You’ll be either heartened or disappointed to learn they are merely stone figurines, posing rather comically with a crest celebrating the completion of the Inverness and Aberdeen Junction Railway. I have a deep affinity with anything comprising the letters IAJ, as they are also my initials. Were that all not enough, Inverness station also has a elegant stone carving of an vintage SR logo, which I’d like to think stood for Scotland’s Railways, though I don’t think such an organisation ever actually existed. 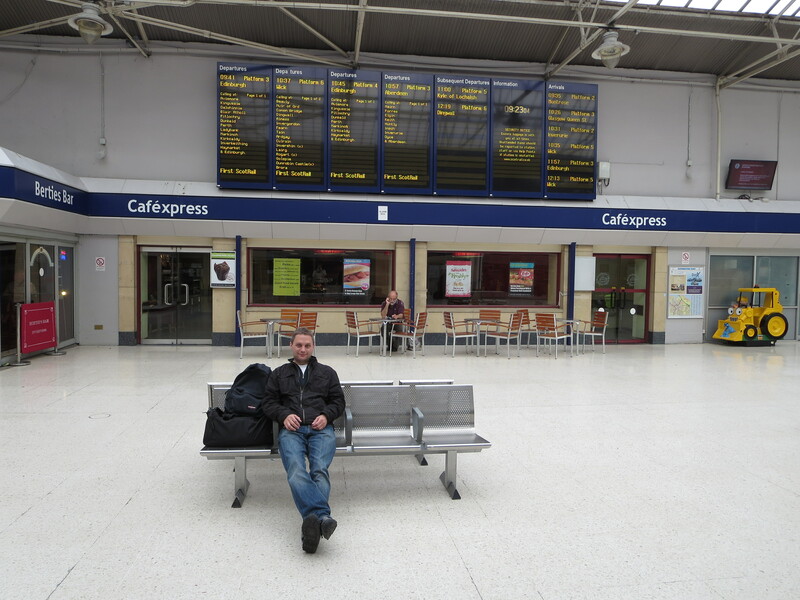 What with this collection of oddities, plus the likes of Bertie’s Bar and the wonderful Royal Highland Hotel next door – where we rather opulently spent the last night of our trip – Inverness station is a fine place to plan, to wander, or simply to wait. Scotland’s landscapes leave a raw but ravishing imprint on your brain that lingers long after you’ve crossed back over its border. If I shut my eyes I can still conjure up the battalions of mountains, the chains of fields, the plummeting streams and the brocades of mist hanging over hills like half-closed eyelids. 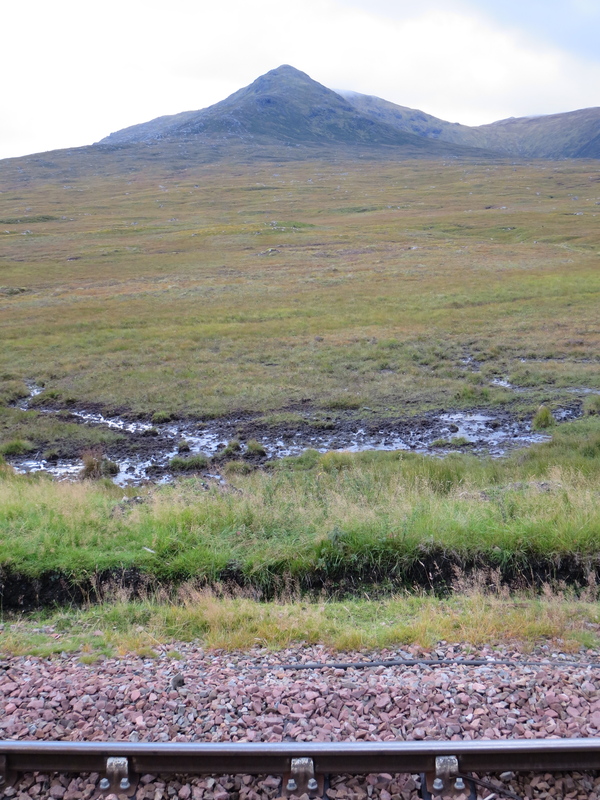 The best way to see all of these things is from a train, because the train is the best way to see Scotland. They take you the edge of wilderness but never consign you there. They tantalise you with glimpses of what seem to be the most abandoned, most unspoiled outcrops of countryside in the land… then rush on to something even more dazzling. 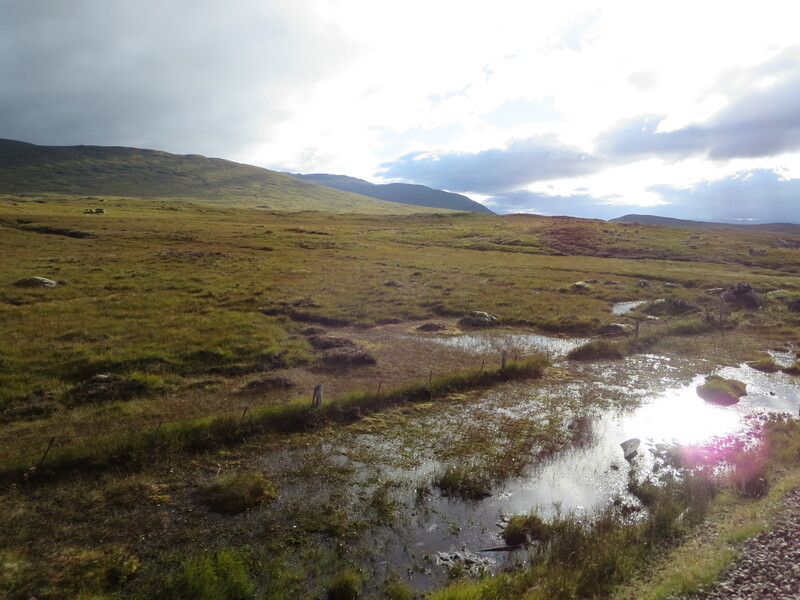 They seduce you with whispers of broodingly romantic places – Crianlarich, the Bridge of Orchy, Achnasheen, Muir of Ord – and transport you, in my case, further north than you have ever been in your life. And they do all this without you straining a sinew or composing a thought. You just sit there. It is quite the most fantastic thing. High land, hard rain. It certainly made this boy wonder. Great trip must do it one day. 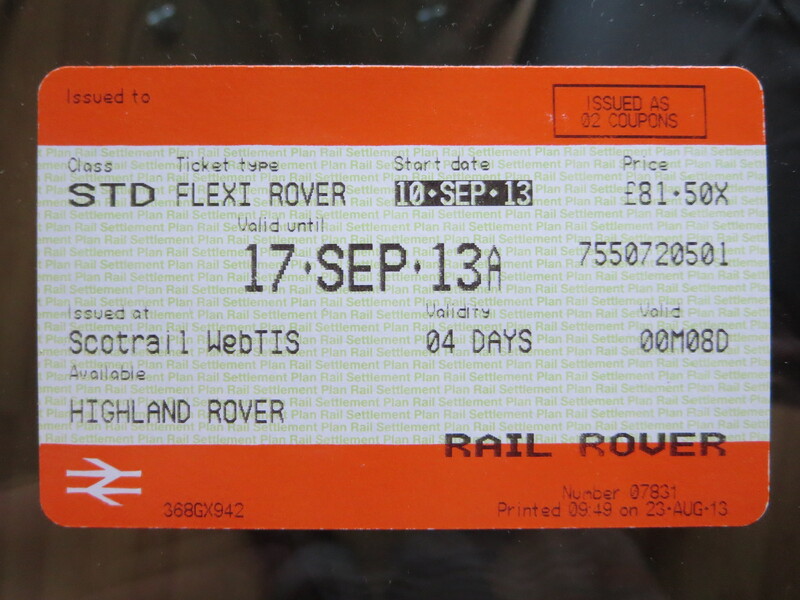 Interesting comment about the rover ticket i recently purchased a Southern all network Downlander, which gives you unlimited travel on the entire Southern network for one day cost £16.50 and can only be purchased on line and must be printed up before travel. We had a spot of trouble at East Grinstead where the tickets checkers had never heard of it, they reluctantly let us pass so we could catch the Blue Bell Railway. Another chap was getting the 3rd degree because he had brought tickets recommended by his station. Great value tickets we went, but not easy to find on their website. Here’s a link to my YouTube film of the trip. “caféxpress” – how are we pronouncing that do you think? “Cafayxpress”? Looks like a great trip – one I’m hoping to take next year. Lovely photos and thanks for the tip about the rover ticket, that will come in handy!